Sophomore Danny O’Regan scored a power play goal—his second score in two games—as Team USA edged Finland, 3-2, in a final pre-World Junior Championships exhibition contest. 2014 recruit Jack Eichel, centering the second line, set up another U.S. score. 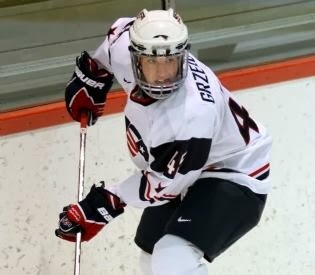 Following the game, BU sophomore Matt Grzelcyk (photo), who played the Team USA squad that won gold in the 2012 World U18 Championships, was named an assistant captain for the U.S. squad. The WJC begins on Thursday with the U.S. taking on the Czech Republic in its first preliminary round game. United States of Hockey offered a preview of the U.S. team and posted thumbnails of the U.S. players. O’Regan: A highly-skilled center with some offensive creativity, O’Regan does a nice job of giving himself time and space and utilizing his linemates. Looks to be Team USA’s top-line center and will be expected to stoke the offense with his playmaking skills. Grzelcyk: A puck-moving defenseman with a high hockey IQ, Grzelcyk is strong in both ends with a good defensive stick and tremendous distribution skills. Was the final cut from last year’s team, but will play prominent role this time around. Eichel: A dynamic offensive talent who combines good size with strong skating, high-end puck skills and elite offensive instincts. Team USA’s youngest forward, but perhaps most offensively gifted and expected to produce. 2014 recruit Shane Starrett posted his second shutout in his past four starts for USPHL Portland, as the Jr. Pirates blanked the Islanders, 3-0. The former Catholic Memorial and Selects Hockey Academy netminder stopped all 19 IHC shots and lowered his GAA to 1.85. WEEI Radio blogger Scott McLaughlin discusses David Warsofsky’s first games as a Bruin and his contribution to the power plan. Three former Terriers—Catherine Ward, Tara Watchorn and Jenn Wakefield— along with current Terrier, Marie-Philip Poulin—taking a year’s leave—were officially named to the Canadian Olympic Team that will skate in Sochi, Russia, seeking to defend the title won in Vancouver four years ago. Call any directions from UK at low cost or make cheap calls to UK- no matter where you are.